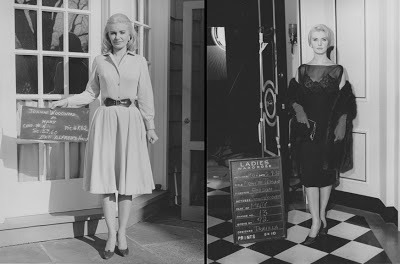 Joanne Woodard and Travilla worked together on four films, with Woodward's husband, Paul Newman co-starring in three of them. The couple developed a very warm relationship with Travilla that lasted until his death. The first of the four productions was From the Terrace in which Woodward portrayed Mary St. John, the wife of an ambitious young executive chooses a loveless marriage and an unfulfilling personal life in exchange for a successful Wall Street career. Hedda Hopper announced in her November 19, 1959 column "Woodward has 20 high fashion styles in From the Terrace and will give a one woman fashion show by Travilla who's designing her costumes." 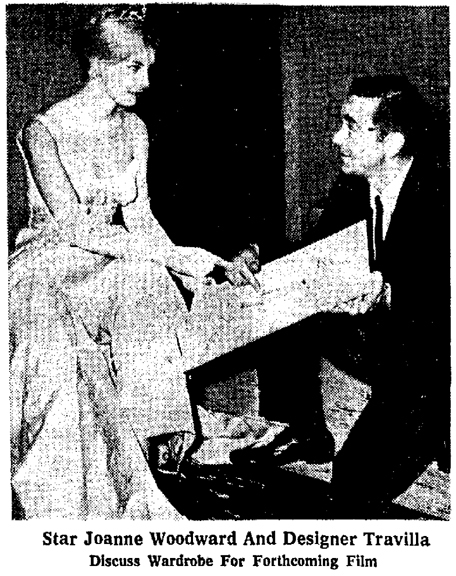 A few weeks later Travilla talked to the press about his latest leading lady, "Joanne is fresh, delightful and a great actress. 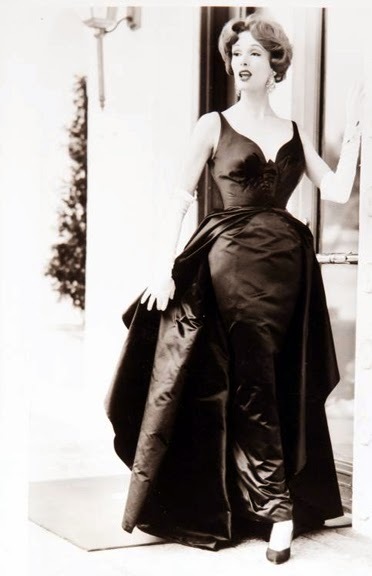 But in all her previous roles she has never yet been seen in high fashion, nearly all required her to appear in extremely simple, even dowdy, clothes. 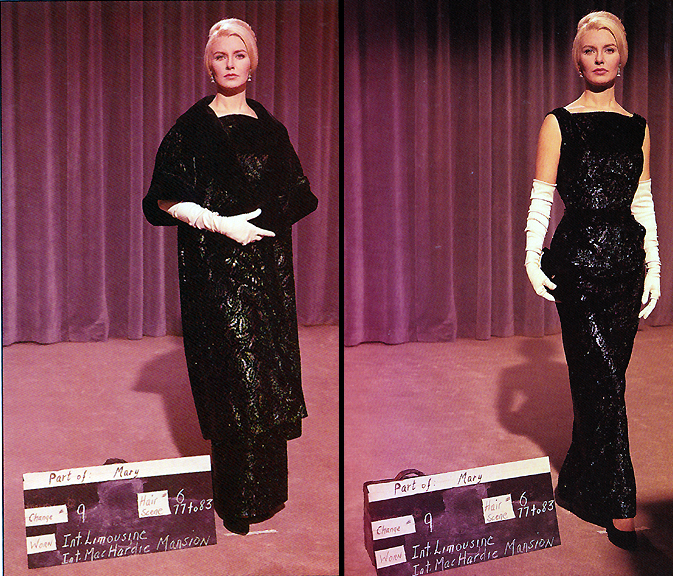 In real life she's the sweater and skirt type, a plain neckline and full skirt were standard equipment." 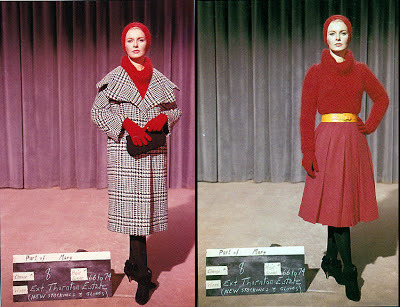 She felt a bit skittish about attempting a chic, high-fashion look." 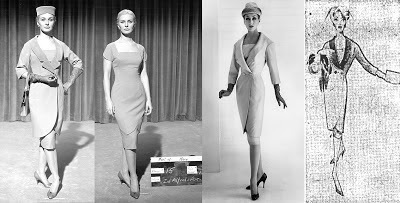 I had trouble convincing her so I showed her some dresses on models and explained that she could look the same in those clothes if she could feel them inside - think "tall" and try a different silhouette than from roles past, as this film required her to be clothed in tons of beautiful outfits." "She ended up wanting all the film creations for her own wardrobe." And why not with over $70,000 being spent on costumes with fabrics costing $30 to $50 per yard imported from France and Italy including silks, worsted wools, wrap-printed brocades and mylar iridescent velvet that simulates a beaded effect of peacock feathers. Travilla told reporters "The assignment was a dream. 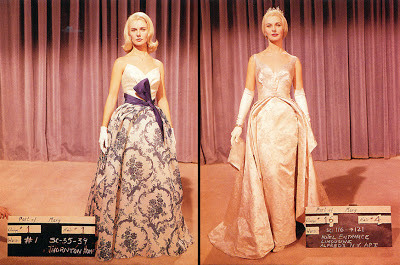 All of the feminine roles are those of wealthy sophisticated women." which the designer would use to his advantage in creating a line of clothing based upon the costumes worn by Woodard in the film, something he would also do in their third film together. 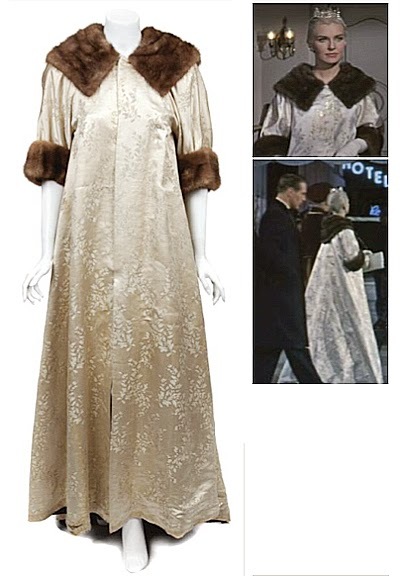 This slim putty-silk sheath topped by a seven-eighths coat styled with cutaway front and a two-button closing at the waistline was adapted from Woodward's which was executed in beige wool with a deeper beige collar for better definition on the screen. 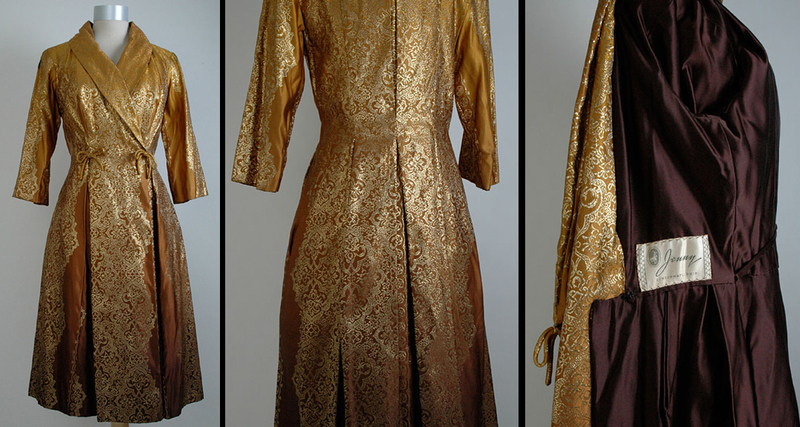 Or this gold ombre dress and jacket combination from the same fabric as Woodward's garment. 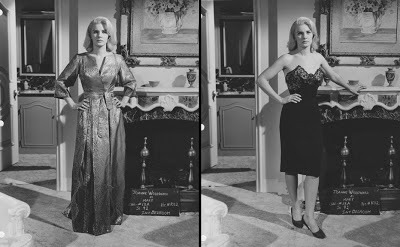 And unknow reviewer described Woodward's wardrobe as: "This being the end of the 1950s, makeup is heavy but flawless, tending to emphasize the two-dimensional image onscreen. 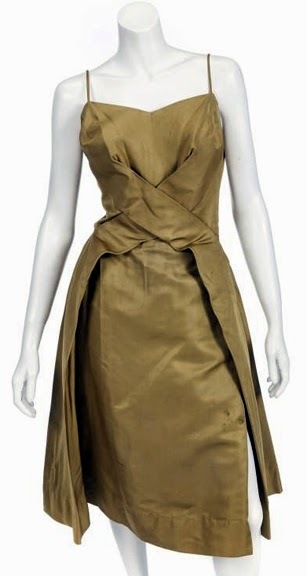 The wardrobe is vintage Travilla, the American designer most well-known for dressing Marilyn Monroe in some of her most memorable gowns (including the white halter dress with pleated skirt in The Seven Year Itch). 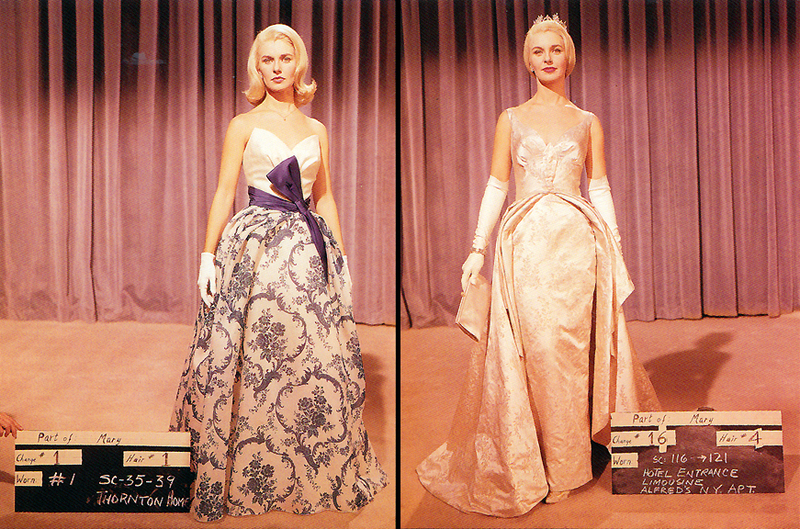 His negligees, daywear, and formal gowns look stunning on Joanne Woodward and the statuesque Elizabeth Allen as the nosy Sage Rimmington. 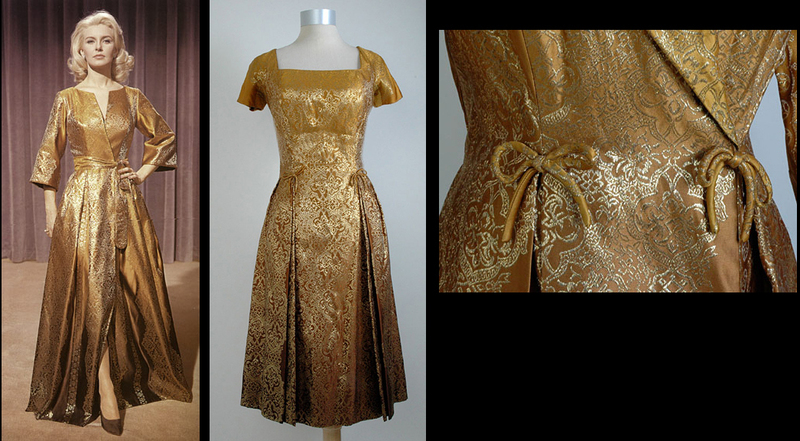 To the popular wasp-waisted silhouette of the day, Travilla added contrasting lengths or structured drapery falling from the hip. 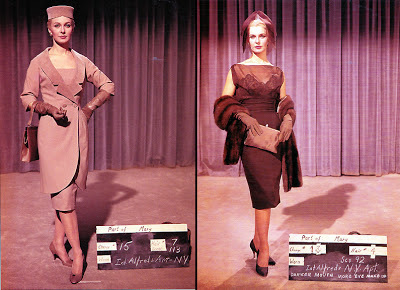 He favored monochromatic looks in this picture, something that is particularly successful in the film’s penultimate scene when Woodward arrives for a board meeting at Newman’s office in an ensemble of corporate grey—dress, furs, gloves, bag, and turban head wrap. 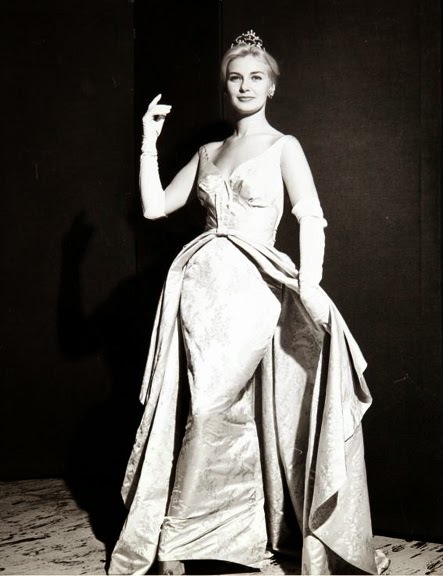 Travilla says much with this costume: Woodward is trespassing on a male-only domain and she’s there on sufferance in spite of the deference of the gentlemen. Everyone thinks Alfred is about to deliver an important presentation, but instead he quits dramatically. He leaves the room and jumps in a taxi, declaring his independence from Mary. Woodward is left on a New York street corner, shouting “Alfred!” like any common fishwife. She may look like Park Avenue, but she’s really Bed-Stuy."